Yes, almost all of us have access to smartphones, tablets, and laptops that can tell us what time it is in any city on the planet. Does it make more sense in today’s world to glance at your phone if you’re curious about the current time in London instead of checking your wrist? Maybe. But, if you ask us, we’re still impressed by mechanical watch functions that don’t require software updates, plugins, or battery charging. In particular, there’s something to be said for the real-world practicality of a watch that can indicate multiple time zones simultaneously—especially for travelers. Today, we’re highlighting some top Rolex models that allow the wearer to easily keep track of (at least) two different time zones. The Rolex Explorer II 216570 sports two time zones making it a great option for those who travel or might just be in a cave for more than 24-houts. 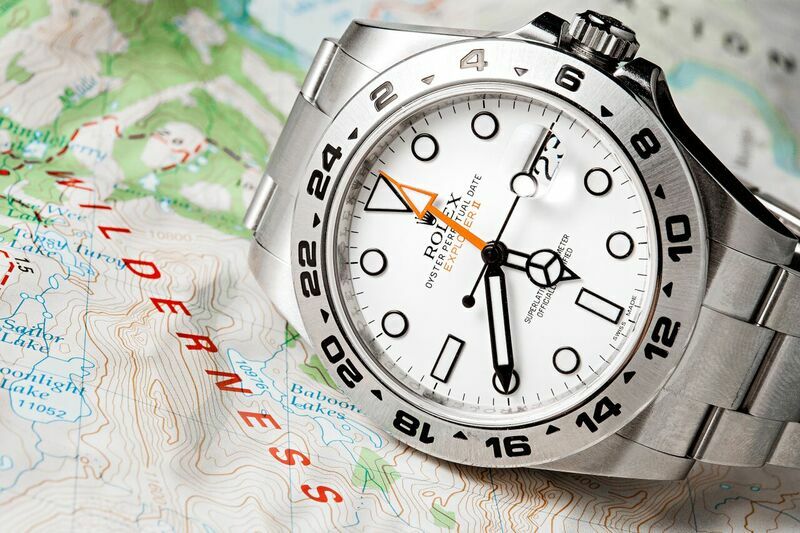 When the very first Rolex Explorer II made its debut in 1971, the bright orange arrow-tipped hand on the dial pointing to the fixed 24-hour bezel was simply an AM/PM indicator. This is because on that inaugural Explorer II, the main hour hand and the 24-hour hand are in sync with each other; so wherever the hour hand is set to, the 24-hand follows. For instance, if it’s 10 o’clock at night, the center hands display the time in a traditional manner while the 24-hour hand points to 22 on the bezel. However, the second reference to joining the Rolex Explorer II family (and every model since) came equipped with an independent 24-hour hand. Therefore, the Explorer II is now a GMT or dual-time watch and not just an AM/PM indicator. When traveling, set the arrow-tipped hand to home time by having it point to the appropriate hour on the bezel then adjust the Mercedes-style hands to display the local time. What’s more, modern Explorer II watches include a quickset hour hand. This means that you can “jump” the hour hand back and forth to reflect local time without messing with the minute and seconds hand. That’s a great feature to have when landing in another city. The GMT-Master II ref. 16719BLRO sports two time zones when using the GMT-hand correctly. Central to the development of the GMT-Master watch in the 1950s was the ability to read two time zones concurrently. After all, this particular Rolex model was made specifically at the request of Pan Am airlines to do just that. Again, in early GMT-Master models, the extra arrow-tipped hour hand and the main hour hand are synced. So the second time zone is displayed by rotating the bezel to the appropriate position. The introduction of the GMT-Master II lineup brought about the independent GMT-hand. So now, modern GMT-Master II watches can indicate three time zones thanks to the adjustable GMT-hand and the rotating bezel. There’s also the quickset hour hand for added practicality. Debuting in 2012 the Sky-Dweller is the most recent watch to hold two time zones. While the Explorer II and the GMT-Master watches are sporty options for travelers looking for a dual time watch, the Sky-Dweller fills a void in the dressier category. 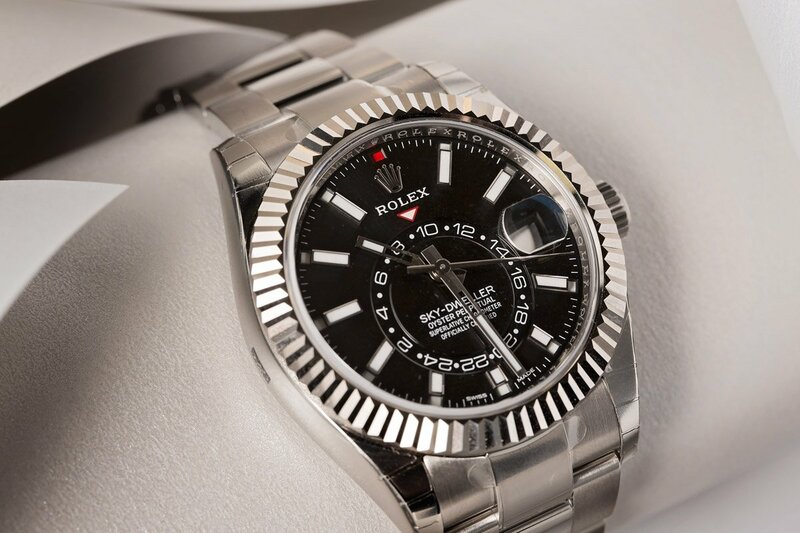 The Sky-Dweller was introduced in 2012 and is one of the most complex modern Rolex watches manufactured today. Fitted with an annual calendar complication (meaning that the watch only needs one hands-on adjustment per year at the end of February) the Sky-Dweller boasts the center hour/minute/seconds hands, an off-centered subdial for the second time zone, a date window at 3 o’clock, and month indicators adjacent to the hour markers. The 24-hour disk on the dial Furthermore, turning the fluted “Ring Command” bezel flips through the different functions so that you can set them accordingly. 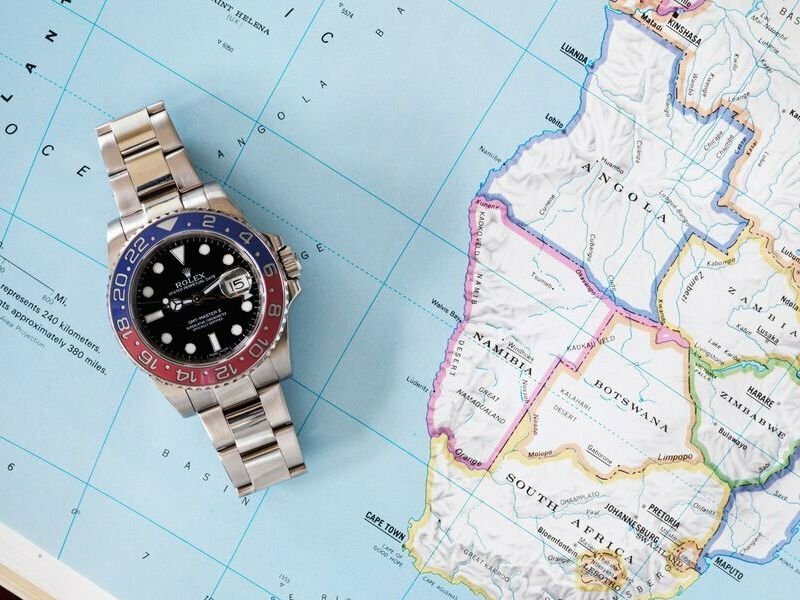 Whether you go for the iconic GMT-Master II, the sporty Explorer II, or the dressy Sky-Dweller, Rolex offers plenty of choices when it comes to GMT or dual time watches.